The final few months of 2014 were rough for many, myself included. Weeks after passed away, some of my family and friends gathered to celebrate my Birthday by painting ceramics. I wasn't sure exactly what I wanted to paint (and wasn't necessarily in the mood to create art), but I wanted it to be something with meaning to me. 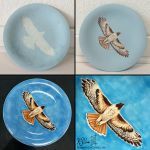 So, after some thought, I worked to painted a red tailed hawk flying free. It seemed appropriate to me. Click twice for the full view. Gorgeous piece. It is simply divine! I really need to take a pottery class… I would love to create such amazing and fine work!